Stones are often used in magickal rituals and worn for their color and properties said to be possessed by that stone. Below is a brief description of the properties of most the stones we have available - more added as we have time. Always trust your intuition and don't take any properties as all-inclusive. Shop Crystals and Stones here. Amazonite. A stunning blue/green dappled stone, Amazonite is a very calming, soothing stone great to hold during times of stress making it the perfect medicine for anxiety. It opens the heart chakra letting love and light flood your body. It can help bring clarity and truth of purpose to your life. Amazonite is also known as the hope stone making it a great tool for manifestation - charge it with your intention to help bring your dreams to the physical realm. Carry as a good luck charm and to help find your truth - even if it hurts. Amazonite also filters incoming energies to clear away negativity and psychic attacks. Keep it next to your electronic devices to cut down negative effects. Amber is related to the fire element & the Sun. It cleanses negative energies, dispels gloom, instills positive energy, brings wisdom, balance, patience & promotes altruism. Amber is self-healing, imparts revitalization, stimulates happiness, opening & cleansing. It provides protection, luck, healing & strength. Amber is a resin often containing remains of insects and other inclusions and can range from a golden honey color to a deep orange/brown. Please note that amber can be damaged by long-term submersion in water or solvents. Take care when cleaning. Angelite. A lovely light blue gemstone, Angelite raises the state of consciousness and spiritual awareness. It facilitates contact with your angels and spirit guides and your higher self. It aids with psychic healing, telepathic communication, astral travel and spirit journeys. Angelite also promotes communication and self-expression dispelling fear, anger, and anxiety. It encourages forgiveness making it a great stone for divorce and other anxious situations. Angelite transmutes pain into healing and wholeness promoting deep feelings of peace and tranquility. It supports the throat alleviating inflammation and balancing the thyroid repairing tissue and correcting blood deficiencies. It is useful for weight control, headaches, heart function, circulatory systems and infectious diseases. Black Onyx. A powerful protection stone, Black Onyx absorbs and transforms negative energy. It aids the development of emotional and physical strength and stamina, especially during times of stress, confusion or grief. Use Black Onyx to encourage happiness and good fortune, give strength during the chaos, and support self-discipline. Useful in healing old wounds or past life issue, black onyx is also wonderful for meditation and dreaming. Black Tourmaline, also known as Schorl, was used by ancient magicians to protect them from demons as they cast their spells. It is one of the premium stones of protection, a psychic shield against negative energies, entities or destructive forces. Excellent for exorcism, protection against ghosts and clearing entities from your space. Black tourmaline is also protection against our modern spirits - radiation and environmental pollutants. It can convert negative thoughts into positive, usable energy and is a powerful grounding stone. It helps channel healing light throughout the body, promotes a sense of power and self-confidence, and is excellent for those that must live or work in challenging environments. Black Tourmaline encourages inspiration, connection, awareness, and creativity. It also comes in other colors including red, pink, yellow, brown, green, blue or violet. It's prismatic, vertically striated structure is triangular in cross-section and slender or columnar. Bloodstone, also known as Heliotrope, is a powerful healing stone for grounding and cleansing the body. It is often used to purify and detox the body and bloodstream. It brings love into any situation and helps ground negative energy surrounding the issue. Bloodstone, which is green chalcedony with flecks of red jasper, enhances functions fo the mind, brings clarity and understanding to topics that were unfamiliar. It is also said to increase energy and strength, removes energy blockages creating a smooth and constant flow of energy through the body. It combats fatigue, irritability, and confusion while enhancing intuition and creativity. It benefits all blood-rich organs including purifying the blood and detoxifying the liver, kidneys, and spleen. Bloodstone also cleanses the lower chakras, realigning their energies. Blue topaz. Provides enhancement to one's mental processing and verbal skills. December birthstone. Colors range thru various shades of blue and are sometimes confused with aquamarine. Carnelian. Used for focusing, realization, and self-actualization, Carnelian stimulates the mind. This makes it a wonderful addition to spells of seeking ambition, focus, and decision making. Citrine. A transparent, yellow variety of quartz, citrine ranges in color from pale to golden yellow, honey or amber and make contain rainbow or sparkling inclusions. It is the stone of manifestation helping bring your dreams to physical reality. It aids with imagination and personal will. Harnessing the power of the sun, it is warm and comforting energizing the chakras, clearing the mind, and encouraging you to take action. It also encourages fresh beginnings and new pursuits transmuting negative energy to positive action. It is also known as the Merchant's Stone encouraging commerce making it great to keep in a cash box to encourage prosperity. Clear Quartz. Clear quartz is the all-purpose crystal of the metaphysical world used for any spell or intent. They can be programmed for your needs with their natural vibration enhancing every spell. Their natural occurring fractures, faces, and inclusions bounce, reflect and refract light. Desert Rose is a variety of Selenite and is said to bring mental ability and clarity as well as aiding perception of all kinds, including intuition. Desert Rose is said to be an angelic stone and is used in crystal healing to quiet worries and still the mind from distractions and disruptions. Metaphysically it is used to dissolve programs and bad habits. It also is said to help align the spine and heal issues of the skeleton in general. Fluorite. Brings rationality to intuition; orderly connection and conscious association to psychic and spiritual growth; balances body, bone, and cellular structures; healing. Good for mental disorders, nervous system. Raises IQ to the highest capacity, excellent for the advancement of the mind. Works with Chakras according to the color of the stone. Offers a stabilizing energy, facilitating order, balance, and healing. Excellent for clarity of mind, objectivity, concentration, and meditation. Aids in grasping higher, more abstract concepts, and to be discerning as to the truth or reality of a given situation. Balances and cleanses intellectual and physical bodies. Strengthens bones and teeth, and is used for dispelling illness in its early stages. Especially good for working with the 6th chakra and for those born in Pisces or Capricorn. In various colors ranging from purple to yellow to green or striped. Gaia. This vivid green gem, derived from volcanic ash, is said to carry the energy of the anima terra, or "soul of the Earth". It aids in Goddess connection, promotes prosperity, is aligned with the heart chakra, & is good for self-healing emotional wounds. Faceted. Green Aventurine has a very soothing energy, recommended for working thru unresolved emotional issues. This lovely medium green gemstone protects the heart, comforts, harmonizes and can help attract love later in life. Green Aventurine is one of the best stones to attract luck, abundance, and success. It is often used in ritual with green candles or kept in cash boxes and drawers to attract money. It opens the Heart Chakra and is tied to the water element. Green aventurine also is known as a stone of personal growth helping you to learn about yourself and your place in the universe with a very calming energy. In healing, Green Aventurine benefits the lungs, liver, sinuses, and heart. Hematite. Beautiful, and often used in jewelry, tumbled hematite has a metallic grey-black coloring and is heavy for its size. Hematite is a very good stone for grounding and balancing your life. As soon as you hold a piece of Hematite, you will feel more calm and centered. Activating the root chakra, it anchors us to the earth and provides stability. It absorbs toxic emotions keeping you from joy and vitality by pulling negative energy from your aura to the root chakra where it is neutralized. Hematite also is great for healing cleansing the blood and supporting circulation. It is detoxifying the environment as well as the body blocking electromagnetic pollution from technology. Hematite brings strength, courage and personal magnetism. Herkimer. This stone makes a fine substitute for a diamond and has the greatest vibrations of all quartz crystals. Jet. This opaque black stone is associated with the earth element & provides psychic protection & purification. It guards against nightmares, strengthens psychic awareness, draws out negative energy & unreasonable fears, protects against violence & illness, increases virility, promotes control of life, fights mood swings & depression, imparts luck & health, & is used in divination. Labradorite. This colorful, luminous stone with flashes of gold, green & blue, belies its dark outer appearance, for it holds within its darkness a rainbow of brilliant hues that can be seen most fully when it is exposed to direct light. Labradorite is used for earth magick & divination. It fortifies intuition & mediumistic abilities, stimulates imagination making us contemplative & introspective, grounds spiritual energies into the body, raises consciousness, is protective, relieves stress & has a calming influence. Malachite is a deep, rich green with many layers compressed over time forming gorgeous swirls, bands, and flecks of different shades of green. Long used as in spells for prosperity, it is said keeping one on your front door or carried in your wallet will attract money to you. It is a sacred stone of the Earth and is often used to represent Gaia and the Forest God. Moldavite. This wonderful & strange gemstone is the only known gem to fall to Earth from the heavens, about 14.8 million years ago. Moldavite can be worn on any part of the body & will affect the entire auric field. It is an excellent meditation stone, often used at the heart, third eye & crown chakras. This powerful stone has an extremely high vibration & helps to accelerate spiritual growth, as well as increase access to inner guidance. It enhances clairvoyance, allows insight into the meaning of our lives, encourages sympathy & compassion. Moonstone. Known as a gemstone of emotional peace, tranquility & harmony, it is also associated with the energies of the Goddess because of its association with lunar energies. It is attuned to the element of water. It facilitates intuition & psychism, is used in divination, imparts love & protection, ensures a restful sleep. Moonstones vibration is calmness coupled with awareness. Its energy is balancing, introspective & reflective. Moonstone is a translucent stone varying in color from a pearly white, to pink or gray. Also see Rainbow Moonstone below. Opal is quite transparent, tinged with a pale, dusky blue. It amplifies the positive emotional states (connect with joy while releasing old wounds), & is the conduit to the truth of our essential joy. It is related to the fire element & aids in clearing the emotional body in the auric field. It brings out inner beauty, loyalty, faithfulness & spontaneity. Pyrite, also called Gold Pyrite, is a metallic gold ore which was often mistaken as gold, hence its other name of Fools Gold. It is said to draw money and prosperity. It resonates well with earth, fire and the sun letting you tap into energy and vitality stimulating the flow of ideas, bringing confidence and the persistence to carry things through to completion. It is also said to shield you from negative energies, environmental pollutants, emotional attack and physical harm. It is a great stone to keep in the workplace as it can guard against control, criticism, and manipulation by a partner, parent or employer. It stimulates both the second and third chakras and enhances protective and assertive male energies making it a great stone to boost confidence and leadership. Native American tribes would often make pyrite into polished mirrors for gazing and divination. Rainbow Moonstone. This delightful gemstone reveals a vibrant play of rainbow colors within its whitish or clear base color &, as with all moonstones, reflects light from within to provide a bright luminescence. Rainbow Moonstone is balancing, introspective, reflective, lunar, & is aligned with the energies of the Goddess. It promotes emotional well being & joy, stimulates intuitive recognition, alleviates emotional tension, promotes good fortune, is protective during travel, & represents new beginnings. Red Jasper. A lovely, brick red color often with inclusions, Red Jasper has a deep connection to the Earth and to Native American's symbolized the blood of the Earth. It connects you deeply to the vibrations of the earth to ground and center. It works slowly stabilizing the Aura. It can bring insights into view to help you towards your goals or to understand why a change may be necessary. It is also known as the supreme nurturer, a must for a medicine bag. It sustains and supports during times of stress bringing tranquility. Rose Quartz. Soft pink rose quartz is a stone of love and beauty. It is a stone of the heart and unconditional love. It is a feminine stone of compassion and peace, healing, and comfort. It is a wonderful stone to use to soothe and heal the emotions, especially those of love, loss of love, or grief. It can also help to reawaken the heart to the love of self and others making it great for dealing with divorce. It is a mothering crystal nurturing of self and others. It is a good stone to carry during pregnancy and to strengthen any bonds of love and connection. Ruby is associated with the fire element and is a clear, bright red. It shields against psychic attack, aids in retaining wealth & passion, assures restful sleep, encourages us to follow our bliss, & guards against storms & negativity. It aids courage & the life force, imparts power & joy. Rutilated Quartz cleanses and recharges all the chakras. It is clear quartz that contains golden strands of rutile, a mineral of titanium oxide. These gold hairs sparkle under the light refracting and reflecting the rays. Rutilated Quartz encourages us to go deep within to find clarity and perspective. It heals emotional wounds, acts as an anti-depressant, and clears the way to spiritual awakening. Meditating with it on a daily basis helps reveal the highest version of yourself. Sapphire. Deep blue sapphires relate to the water element & relax, focus & calm the mind. They restore balance within the body, release depression & spiritual confusion, impart mental power & self-discipline, enhance psychism, love, meditation, healing & peace. They are used in defensive magick & are the guardians of love. Selenite has a ton of healing and mystical properties. It is a soft gypsum crystal that naturally occurs everywhere named after the Greek Goddess of the moon, Selene. It is a soft stone, tubular in shape, with striations running along its length. Warning: Selenite is water soluble so do not soak. It helps to stabilize and balance the emotions making it a great crystal to soothe anxiety. Place them around any area or space to help neutralize negative energies and to ensure a calm and peaceful environment. Use a selenite wand to cleanse your aura and help remove impurities and negative energy for healing. Placed near or under the bed, it can bring peaceful sleep and keep away negative energies. Seraphinite. This unusual stone is primarily a deep green color, with feathery inclusions of silver-colored iridescent formations making intricate internal patterns. It is thought to be among the most important stones yet discovered for connecting with the higher energies. It is a purifier, & cleanses the aura, chakras & energy meridians. Seraphinite is centering & energizing, integrates the heart & crown chakras, a powerful tool for developing compassion, & a premier healing stone. It brings the physical body in line with Light energy. Serpentine. An earthing stone, Serpentine opens new pathways for Kundalini energy. It aids in meditation and enhances spiritual exploration. It helps retrieve wisdom and memories opening the crown chakra and psychic abilities. It can help regain memories of past lives and corrects mental and emotional imbalances, helping you feel more control of your life. It is also said to help with diabetes and hypoglycemia aiding in the absorption of calcium and magnesium and eliminating parasites within the body. Serpentine is extremely cleansing and detoxifying for the body and blood. Shungite actually can conduct electricity aiding in the inhibition of electromagnetic fields to protect you against harmful radiation from technology. Shungite purifies water when placed next to a pitcher or glass. The charged water is said to increase the rate of healing, cell growth, and detoxification of the body. Other healing properties include headaches, back pain, blood pressure, inflammation and muscle pain. Shungite boosts the immune system, fights insomnia, boosts energy, reduces stress and relieve anxiety. Siberian Green Quartz. This lovely blue/green stone stimulates creativity, is clearing & balances the heart chakra. Smoky Quartz links to the highest realms of being and amplifies the truth of everything around it. It helps to open the heart to light and positivity while helping you ground. Tied to the Earth, it is in tune with the energies deep inside the earth with a distinct strength to clear and purify the environment. It recognizes electromagnetic and geopathic stress, neutralizes it, and returns it to the earth to be purified. It is often used in Fung Shui around electronics to purify the area. In healing and crystal grids, it amplifies the strength of the stones around it. Sodalite, known as the poor man's Lapis as it is often dyed and sold as its pricier cousin, is a deep blue stone with veins of white. It lacks the gold specs of Lapis, though is still a powerful stone in its own right. Sodalite is a stone that taps into your intuition to help activate your inner guardian angel. It protects you from darkness and always keeps you moving towards light and love. It gives a boost to your adrenal glands and calms emotions. It also stimulates the pituitary gland opening up your spiritual perception. Sodalite helps you know yourself at your deepest level giving a boost to confidence and self-esteem. It stimulates ideas, perception, creativity, and endurance. Sunstone enhances personal power & will, helps heal depression, provides protection, health, & physical energy. It stimulates sexual arousal & increases sexual energy. Tigers Eye. 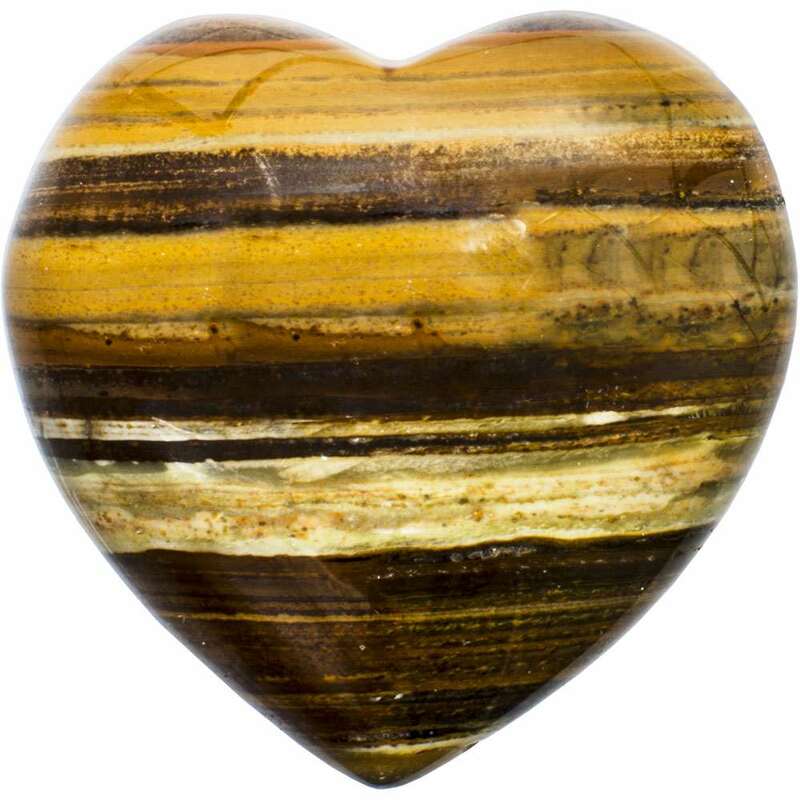 Beautifully striped in shades of brown and gold, Tigers Eye is not only one of the most beautiful gemstones, but one of the most ancient and powerful gemstone talismans. It was used in Ancient Egypt as eyes in their deity statues to express the divine vision and was said to provide the protection of the earth and sun combined. It brings clarity to the inner vision and better understanding of the cause and effect of situations. It supports necessary change, strengthens the will and clarity of intention to manifest at the highest level and for your greatest good. Turquoise is associated with the earth element, aids in healing and brings luck, protection, and courage to the wearer. It can also be used to attract both wealth and love. Unakite is a green and red granite primarily composed of pink orthoclase, feldspar, clear quartz, and green epidote. It balances the emotional and spiritual bodies providing release o energetic blockages. Unakite helps release the past so you can move into the future with confidence. It is useful for past-life regression and activates the 3rd eye Chakra. Unakite is great for the reproductive system, promotes healthy pregnancies, and aids the development of unborn babies. It can also protect against electromagnetic pollution like computers and cell phones. Shop Crystals and Stones here. More coming soon.